Wide and long tracks plus easily adjustable counterweights pipelayer Komatsu D85C-21 ensures the machine is stable. 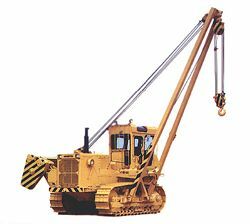 Wear-resistant diesel engine Komatsu S6D125 has a capacity of 225 HP for hoist work. System direct injection saves fuel costs and improves performance. TORQFLOW transmission provides smooth shifting and change of direction.